Visualized records from 1 to 8 - 11 Records found with this search. Iron with a core. 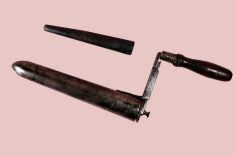 Metal with wooden handle. 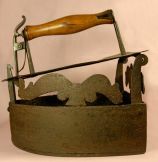 Curiously shaped, the iron has a small bar inside that was inserted after being heated. 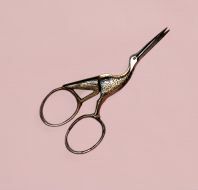 Thanks to its peculiar shape, the tool was capable to reach every corner and the most unreachable folds. 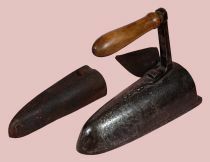 Mushroom-shaped iron used for muffs. 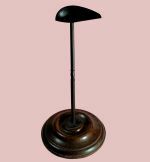 Wooden round base. Metallic vertical axis and shoulder rest. 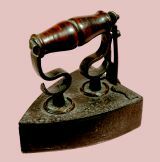 This iron, together with other shaped like eggs or balls, was used to iron particular garment such as muffs, hats, bonnets, ruffles and volants.